Rackmount Frequency Standard, Rubidium or Crystal, Sine or Clock, Programmable Frequency, Manufactured by Novatech Instruments, Inc.
Model 1450B Rubidium Standard with Optional 30MHz DDS Signal Generator. The 1450B outputs can be configured as sine waves or square waves and can provide frequencies of 10MHz, 1MHz, 100kHz, 1pps or an optional signal generator output. The signal generator uses direct digital synthesizer (DDS) technology and is programmable from 100Hz to 50MHz. The 1450B also includes a 1pps input that can be used to discipline and automatically calibrate the 1450B. 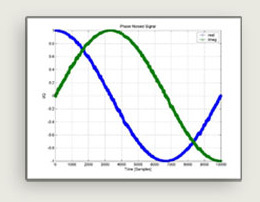 The 1pps input signal is typically obtained from an external device like a GPS frequency receiver/antenna. The Novatech GPS1 Smart Antenna with 1pps output is available as an accessory to provide a complete turnkey solution.